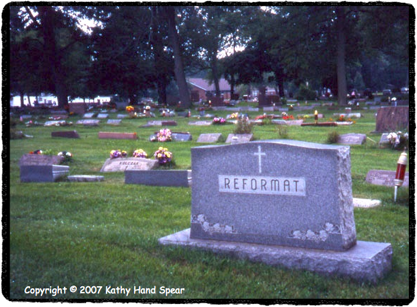 ... for people who love cemeteries. According to the Austrian Times, Hu Chuang of Chongqing, Southwest China, was so passionate about computers that when he passed away unexpectedly at age 26 (while emailing friends!) 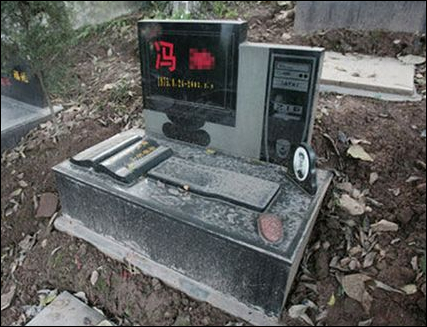 his family had a tombstone made for him in the shape of a computer. The design includes a monitor (with his image and the dates of his birth and death), a desktop computer, and a keyboard. "His parents kept his email address open and encouraged friends and family to keep sending him emails because, who knows, maybe he can read them on the other side," said one family friend. Most criminals are not very smart, as this story proves. If you are going to destroy property, it is probably best NOT to leave your name at the scene. Police said they have charged two teens with criminal mischief for their roles in defacing veterans' monuments at a local park. Police said they were led to the teens after a tipster recognized the graffiti as the work of a Farmingdale man. [One of the vandals] spray painted one of the granite monuments with the word "rude,''which is his "tag,'' - a moniker he uses for graffiti, said Detective Sgt. James Smythe. The tipster told police [that this individual is] known by the tag, "rude,'' [and] several other people ... corroborated that information. When the detective took [the vandal] into custody, the teen had a notebook with the word "rude' written on the cover, police said. 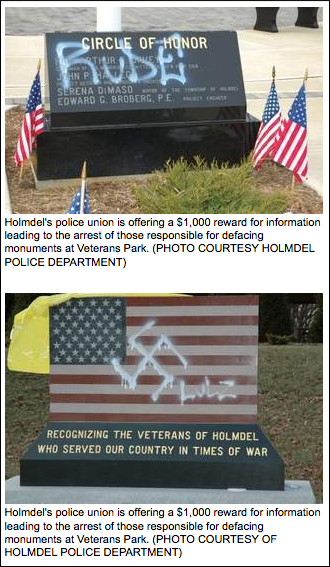 HOLMDEL — The local police union is offering a reward for information leading to the arrest of the culprits who spray-painted veterans memorials here. Police said they believe the granite monuments at Veterans Park on Telegraph Hill Road were defaced sometime between Monday night and early Tuesday morning. Holmdel Policemen's Benevolent Association Local 239 is offering a $1,000 reward for information leading to the apprehension of those responsible, the sergeant said. All calls will be kept confidential, he said. 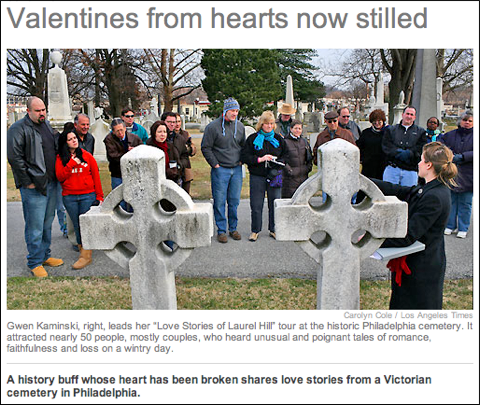 Read the entire lovely story at the L.A.Times web site. It didn't take long to find the little creeps. Four teenage boys were arrested Wednesday night in connection with the recent desecration of Poile Zedek Cemetery, authorities announced. The four teens, city residents aged 15 through 17, are suspected of toppling nearly 500 headstones in two waves of vandalism at the Joyce Kilmer Avenue burial ground used by two area synagogues. ... there is little to indicate that the juveniles specifically targeted the Jewish community, a joint press release from Prosecutor Bruce J. Kaplan and city Police Deputy Director Anthony Caputo said. Three of the juveniles, identified as being aged 15, 16 and 17, are suspected of pushing over 17 granite headstones around New Year's Day, according to investigators. The three are believed to have returned to the cemetery with a fourth person, aged 16, on Sunday and pushed over several hundred more headstones, at least one of which weighed over 4,000 pounds. About 60 of the monuments were fractured beyond repair. The executive director of the Jewish Federation of Greater Middlesex County, Gerrie Bamira ... said she was encouraged by the support, financial and otherwise, that has poured in this week. On Thursday, within hours of sending out fundraising e-mails locally, Bamira said, the federation received dozens of donations that will go toward the cemetery's restoration, where about 15 burials take place each year. People can contribute to the fund by visiting www.JewishMiddlesex.org. Merv Griffin is still making people laugh. Hollywood legend Merv Griffin is still getting laughs — from beyond the grave. As one of his final wishes, the late talk show king asked that his granite grave stone bear this tongue-in-cheek inscription: "I will not be right back after this message." Now his irreverent last words are drawing crowds to the tiny Westwood Village Memorial Park in Los Angeles — which is also the last resting place of Hollywood legends Marilyn Monroe, Dean Martin, Carroll O'Connor and Jack Lemmon. 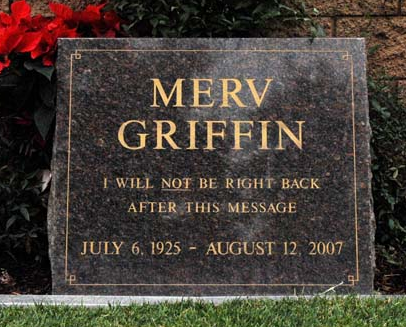 Told that Merv is still getting laughs in the graveyard, his company spokesperson Marcia Newberger told The ENQUIRER: "Merv would have wanted it exactly that way." Merv died Aug. 12 at age 82 after a long battle with prostate cancer. He left a $1 billion estate — and a legacy of smiles. 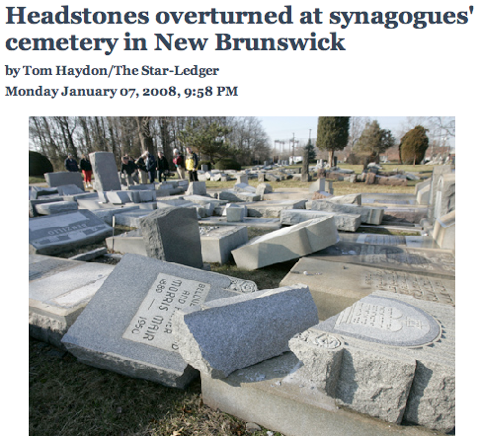 "Hundreds of headstones were overturned at a New Brunswick cemetery largely used by two synagogues, authorities said today. Police believe the acts of vandalism were committed over two different days. On Wednesday people found 17 headstones knocked over at the Poile Zedek Cemetery on Joyce Kilmer Avenue, but hundreds more were found overturned at 8:55 a.m. Sunday, police said. 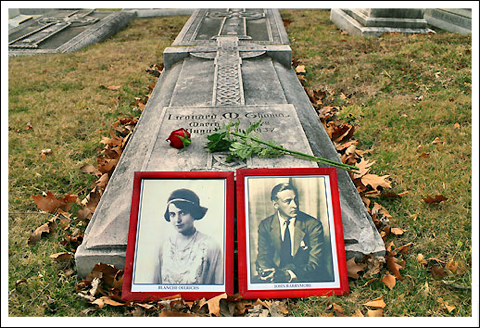 A total of 499 headstones were overturned." With some of the stones weighing more than 2,000 pounds, New Brunswick police said the rampage had involved more than one person and taken several hours. Jack Oziel, a member of Etz Ahaim whose parents’ tombstones were shattered, said the synagogue was organizing a fund-raising event to replace the gravestones in cases in which there were no surviving family members. Our condolences go out to the families who are suffering as a result of this senseless destruction. 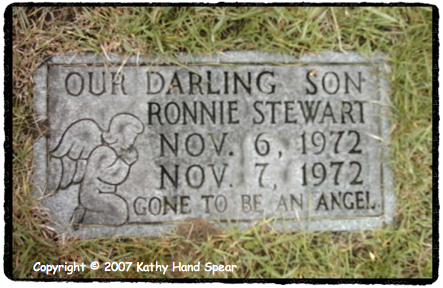 How can one not be touched by this lovely stone? 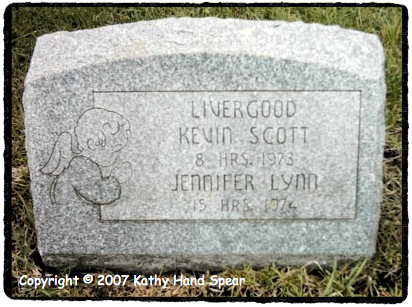 This family lost two children in two years. The first, a son, was born in 1973 and lived just 8 hours. The next year, a girl survived only 15 hours.